Building on the discussions at the Apple hearings last month (more on Apple here, here and here), this hearing will further debate the issue of the taxation of multinational corporations. Politicians have the tendency to over-simplify the issue of the taxation of multinational corporations and miss key facts. 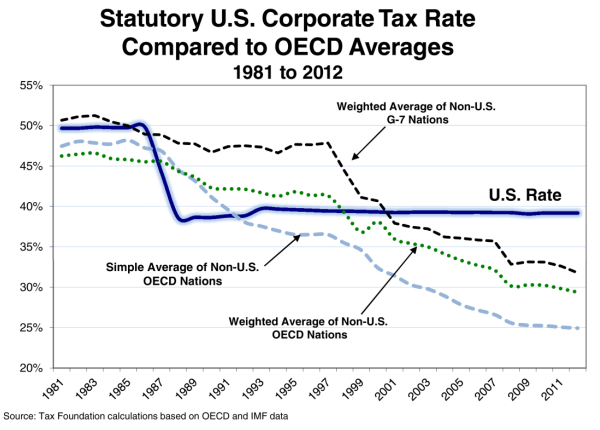 At 39.1 percent (federal plus state), the United States levies the highest corporate income tax rate in the world. This is 14 percentage points higher than the OECD average. 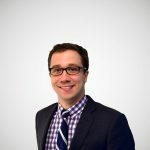 And even though our tax system is cited as having many loopholes and deductions that lower the tax burden of corporations, we also have one of the highest effective tax rates at about 27 percent. Although both politicians and the press continually repeat the myth that corporations hide their income overseas to avoid taxation, in reality corporations pay a substantial amount of taxes to foreign governments. Plans to increase the taxes on this income further risks double-taxing these overseas profits. Corporations first pay income taxes to the countries in which their profits were earned. Then when they repatriate their income to the United States, they are taxed again at the U.S. corporate income tax rate (minus the foreign tax credit). For example, if a subsidiary of a U.S. firm earns $100 in profits in England, it pays the British income tax rate of 23 percent (or $23) on those profits. Then when the profits are brought back to the U.S., the firm is required to pay the difference between the U.S. rate of 35 percent and the British rate of 23 percent—$12. Between the two nations, the U.S. firm will have paid a total of 35 percent in taxes on those foreign profits. The U.S. is one of the only countries left that taxes income on a world-wide basis. 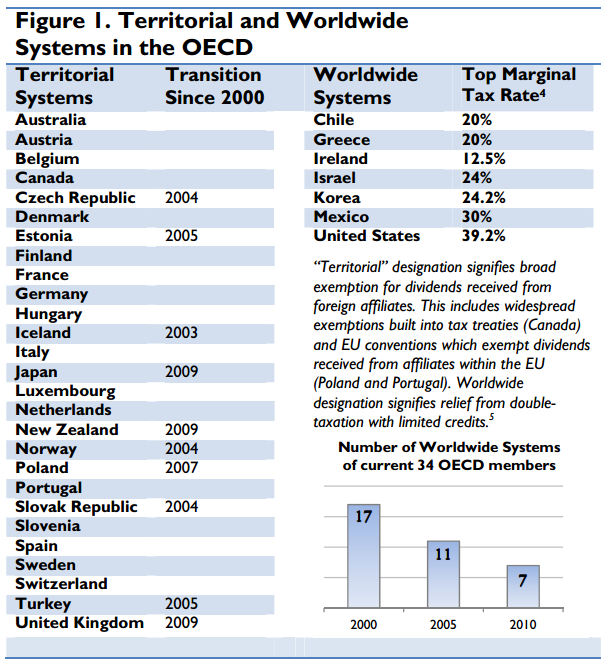 For the past couple of decades, realizing the economic benefits, countries throughout the world have been moving to a “territorial” tax system. A system that only taxes the income of corporations in the country they earned those profits. 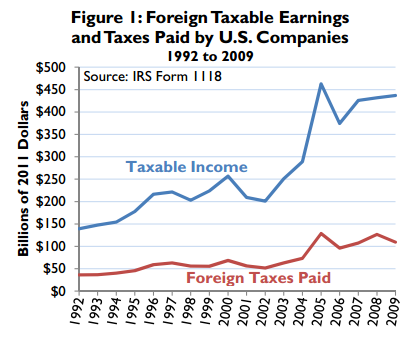 When corporations want to repatriate their income earned overseas, they have to pay the difference between the taxes paid in the foreign country and the taxes owed in the United States. This “toll charge” makes bringing profits back to the United States much more expensive than it otherwise would be, trapping capital overseas and preventing the free-flow of capital back to the U.S.